ADOPTION: How do I adopt from PAWS? How can I adopt a dog/cat, I don't live in Manila? ADMISSION / ABANDONMENT: Can PAWS adopt/take my pet? Can I donate my pet to PAWS? Nag-aampon o tumatanggap ba ng aso o pusa ang PAWS? Aggressive (Matapang/Wild) Dog. Can we surrender? BRANCH OF PAWS: Are there other PAWS branches? Sana may PAWS dito! CITY POUND: Help! My dog was caught and was taken to the pound. Is this right/legal? CRUELTY: Online photos / videos / links, what can I do about these? DOG BITES: Help! I was bitten by a dog. What do I do? DONATE: How can I donate to PAWS? FOSTER: Temporarily keeping a rescue is one of the most important things a volunteer or concerned citizen can do. What does it take to foster? HUMANE EDUCATION - BARANGAYS / SUBDIVISIONS : Does PAWS give seminars for barangays on animal care, catching of strays, responsible pet ownership? NEGLECT: My neighbor is beating their pet. My neighbor is not giving food/water/shelter. PET SHOPS / PETS FOR SALE: Is it ok to buy from a pet shop? Is it legal to sell animals in the streets? How do we get rid of puppy mills? I did my research and I really want a purebreed. Any tips on how to choose? SICK PET: Help, my pet is sick. What do I do? SPAY/NEUTER: What to expect / How much? SPAY/NEUTER: When will there be an Outreach here in my province? SPAY/NEUTER: When is the next free spay/neuter at PAWS? Sana meron din dito sa province namin. S/N Outreach: How much will it cost, How to organize? STRAY-RESCUE: How do I admit this poor puppy/kitten/cat/dog I saw on the streets? STRAYS - How to get them off the streets? STRAYS: Why are there stray cats and dogs? ACTUAL REPORT: Dog with cyst. Need assistance. VET SERVICES: Does PAWS offer vet services? VET MALPRACTICE: My pet died at the vet, I think this is negligence, how can I complain about it? VOLUNTEER: How do I become a PAWS volunteer? / I'm not from Manila, how can I volunteer? / Can kids volunteer? ABANDONED DOGS, PUPPIES, CATS, KITTENS - Can PAWS rescue them? ABANDONED NURSING KITTENS: Help! I found these little kittens and I don't know how to take care of them. BEHAVIOR AND TRAINING: My dog has biting/aggressive problems, etc? What do I do? BOARDING: Can I board my pet at PAWS? Can my pet stay temporarily at PAWS? BURIAL/CREMATION: Does PAWS offer these services? DR. DOG : How can my dog be a part of the Dr. Dog Program? EXOTIC PETS: Is it legal to keep exotic animals? LOST PET: My pet is missing. Can you help me? PAWS LOGO: Can our group use the PAWS logo for our event that will benefit PAWS? Can I use the PAWS logo for my blog? Letter of Request for an Investigation on the Animal Crush Video circulating in social media sites. 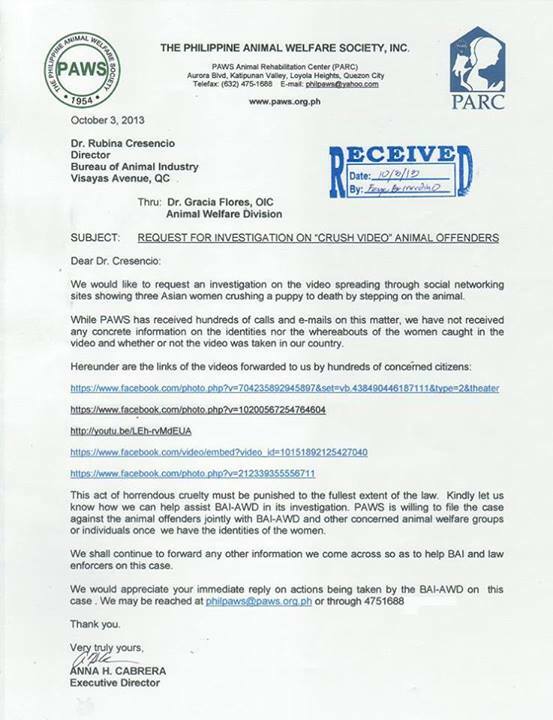 We have sent a Letter of Request to BAI-AWD for an Investigation on the Animal Crush Video circulating in social media sites. We are trying to our best to gather more information as to whether this video is the same one in a previously filed case, or a new one. If it is the latter, we implore the source of this video to please step forward and provide the necessary information so we can immediately file a case against the perpetrators of this horrific act. We have, so far, responded to 80+ calls and at least 400 emails (and still counting) from concerned citizens reporting about the video post. Our undermanned office consisting of three people are doing their best to keep up with the onslaught of calls, texts, emails, comments, and tweets. We would like to plead to the netizens: please refrain from flooding our emails, FB posts, twitter and phones with the same report--we assure you that we are working hard on this issue, and tending to all calls, messages and reports take time away from the volunteers and staff who are trying to juggle this case and managing the shelter and responding to other urgent Animal Welfare matters (rescues, legal assistance, medical assistance etc). Please do not hesitate to contact us should you have personal and accurate knowledge as to the identities, source and whereabouts of the people behind this video. We have been receiving numerous reports on a video circulating on Facebook regarding an small puppy being crushed to death by three unidentified women. This is categorically called a Crush Video; a pornographic material that caters to a horrible, twisted audience.It is a shame that such barbaric and twisted act of cruelty has been made into a moneymaking scheme by fellow Filipinos. We are, as with everybody who has seen the post, enraged that this is happening in our own country—and that it is happening at all. We have, so far, responded to 50+ calls and at least 150 emails (and counting) from concerned citizens reporting about the video post. Our undermanned office consisting of three people are doing their best to keep up with the onslaught of calls, texts, emails, comments, and tweets. Please note that a criminal case has already been filed by the People for the Ethical Treatment of Animals (PETA) against crush video makers. This video may be the subject of the case filed by PETA, and may have just resurfaced in the Social Media networks. We were recently in touch with the PETA office; they too are receiving several reports on the video and are also trying to locate the source of the post, and if it is indeed an old video. We implore the source of this video to please step forward and provide us with an affidavit so we can file the necessary criminal charges against the perpetrators and bring justice to their innocent victims. Without an affidavit or witness coming forward, we also need the names and addresses of the people in the said video, this will be another horrifying instance of Animal Cruelty which will not see its day in court--and this is not something that anyone wants forgotten. 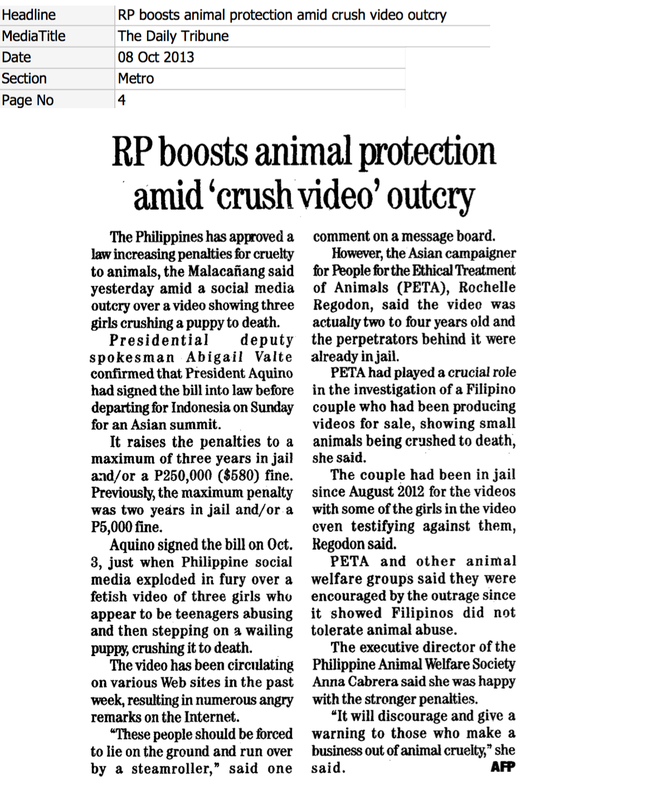 The investigation of People for the Ethical Treatment of Animals (PETA) on the crush videos in 2011 led to the arrest of the people behind this cruel act. PETA filed a criminal case against them. The couple behind the crush videos have been in jail since August 2012. We were in touch with the PETA office as soon as the reports started coming in, and they too were receiving several reports on the video and they were trying to locate the source of the post. 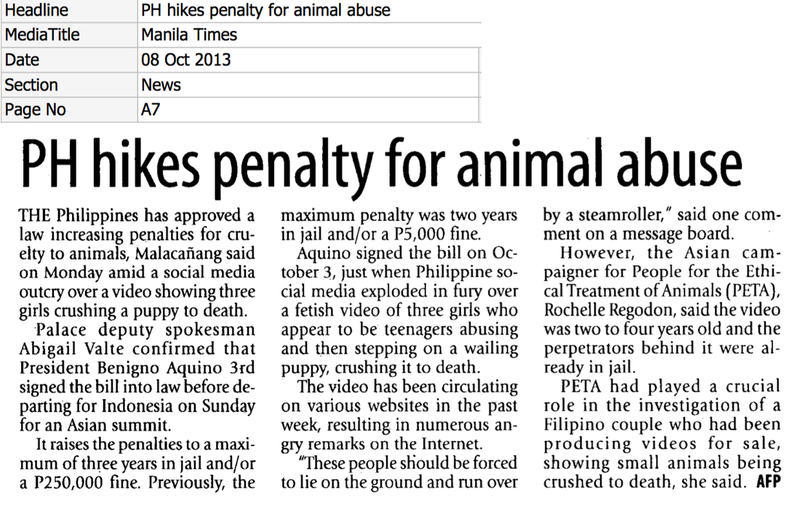 PETA confirmed that the video currently circulating is an old video from 2-4 years ago and it may have just resurfaced in Social Media networks. You may contact PETA ASIA PACIFIC (email: RochelleR@PETAAsiaPacific.com) directly for specific updates. PETA Asia Pacific Statement: In July 2011, a year-long confidential investigation by PETA Asia and the Philippines National Bureau of Investigations resulted in multiple cruelty-to-animals charges against and the arrest of a couple allegedly responsible for maintaining a website selling “crush” videos—including the said video (woman burning dog) you mentioned. In September 2014, a Philippine court found Vicente and Dorma Ridon—who have been in jail since June 2012—guilty of child abuse, animal welfare crimes, human trafficking, and wildlife-protection crimes for forcing girls to torture and kill puppies, rabbits, and other animals in “fetish” videos. The Ridons were sentenced to life in prison and fined more than 9 million pesos. To read more about this issue, please go to http://blog.PETAAsiaPacific.com/companion-animals/breaking-news-makers-cruel-crush-video-sentenced-details. You may contact PETA ASIA PACIFIC (email: RochelleR@PETAAsiaPacific.com) directly for specific updates.